STUNNINGLY APPROPRIATE POP CULTURE REFERENCE! Well, I’ll just leave this here. You were my inspiration; my guiding light. Dwaaaaa look at Skarva holding Lorelei protectively. Really? She’s not the most effective meat shield. That’s what Cyril is for! As cute as that is I wouldn’t want him screaming in my ear like that. Dwaaaa look at Skarva holding Lorelei protectively. Oh yeah, weren’t they supposed to be looking for something here? The quest isn’t done yet! But it almost is! Finally! Maybe?! Provided that this is the boss, and not just the halfway mini-boss with 5 more challenges to go. Apparently the gods don’t appreciate swearing skarva. 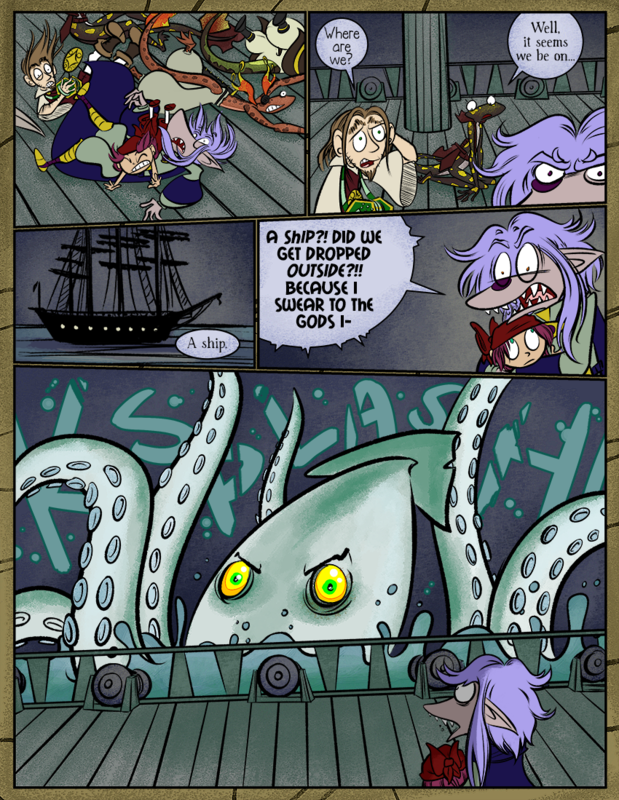 Perhaps you should use cleaner words next time you talk to them, so they don’t send a sea monster to attack you. The gods can cut him some gosh darn slack! He just fell quite a ways, after climbing stairs for 20+ minutes. In fact, how they’re all still alive, I have no idea. Bones in a video game logic world are made of sterner stuff, I suppose. Oh, Scarvy. Did you forget about the dungeon boss? Being the hero kind of stinks sometimes. It’s not so fun to get a taste of one’s own medicine, is it? This guy could be an armful–indeed, he’s an arm-y unto himself! They’d better deck him quickly! We haven’t spoken in a while, Thaumy! What’s crackin’? Thanks! It’s really really fun when I get to draw uncommon creatures… like that dragon back in Frostbite Fortress. (It really stands out compared to the art on the rest of the page, too.) We need more bosses! There really isn’t much to report on my side, I’m afraid: my situation is pretty much as it was when last we spoke, I think. I would say ‘CALLED IT’, but… that is a not-so-mini boss. The Kraken doesn’t seem to happy about them being there either.